TRANSLATOR'S NOTE - The commentary that follows is derived from a monumental text entitled "The Lives of the Caldan Merchants" published by Drachir Redins in the year 1297. The original folio was translated from the Marentian original by Richard Snider in the year 1984. It is an abridged commentary that details the travels of Tav S’bartav Bara through Donara in the year 1099. "The paucity of the crop in Mordara, a county just south of our nation, creates a splendid opportunity for proﬁt for our house. Food sells for an enormous price and the family will surely prosper if we can strike before the winter harvest comes in." TRANSLATOR'S NOTE - An excerpt from a letter from Tau S'bartav Bara to his father Bartav S'ghavi Bara. After reading this missive. the family decided to send Tav on his trade mission into Donara without delay. 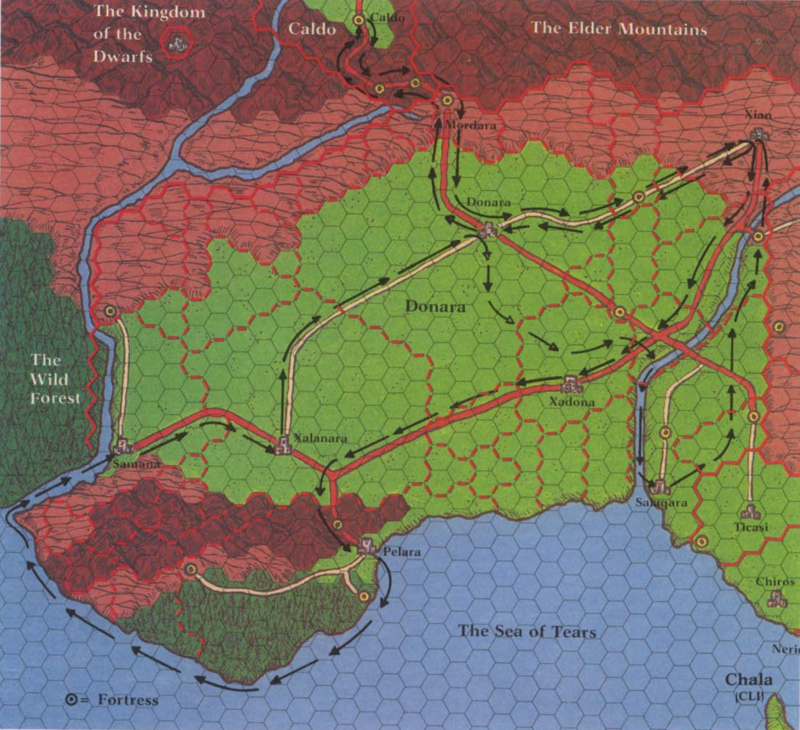 (1/24/99) At last, my first journey into the land of Donara. From all reports. it is a strange and paradoxical land. At one and the same time, it is a young, energetic nation and a land that was old before Clans Caldo and Bara first entered the pass into our home. The very thought of the diversity and knowledge that must lay in this land is enough to excite the mind and enflame the senses. I can’t wait. (2/5/99) After a tiresome journey through the snowclogged passes of our mountains, we reached Stone Fortress — our southernmost defense against the Donarans. After a day spent resting and obtaining provisions, my caravan pressed on into Donara. Our first stop was Fortress Mordara (2/8/99), a devilishly constructed. nearly impregnahle fortress that is the key to Donara's defenses against our valiant armies. TRANSLATOR'S NOTE — In reading this commentary, the reader must keep in mind that the merchant Tav, if anything, is a rabid Caldan patriot with a great love of his country. As a point of interest, Tav's caravan consisted of four wagons, four drivers, six Kazi guards and himself. They crossed the border loaded with food. We dallied in Fortress Mordara for three days and found it to be a stolid and most unremarkable village; The villagers seemed, to our eyes, to be hard-working, very subdued and just a hit anxious when constables were near. This is understandable. Fortress Mordara, as well as being a great fortress, is the main prison for Donara. It houses the most deadly felons from all of Donara. The pitiful wretches that find their way here are brutally used by Baron Doran, Warden of the Fortress, to work the great mine in the area. Each morning that I remained here, I saw hundreds of chained prisoners being led out to their labor. Each night they returned. carrying their dead. The baron must truly be a greedy and evil man to so cruelly abuse those that are placed in his charge. Oh, how blessed it is to be a citizen of a nation where such evil would not be tolerated. Sweet, sweet Caldo. After making our connection with a prominent trader, we moved on to Mordara. the county seat, to consummate our trade. Mordara is a large village with some eight hundred citizens. Its people seem to be happy and dedicated to their work. The town's business district is jammed with ironmongers with little more for anything else. The very morning of my arrival (2/14/99) l sold my wares to one Hosen, the largest food merchant in the city. The profit was substantial, but not what I had wanted. Noting the inexpensiveness of iron, and hearing of the high price to be had for it in Donara, the capital, I spent the remainder of the morning and the entire afternoon negotiating to fill my empty wagons with Mordaran iron. When I returned to my wagons, after concluding a deal with Bersan the Ironmonger over dinner, I learned of the seamy side of this village. My Kazis, very upset, informed me that the only inn was an overpriced rathoie called the Silver Tusk. Further it was managed by Ghoi Caldo, an infamous felon from the city of Caldo. TRANSLATOR'S NOTE — Ghoi Caldo was banished from the nation for bestial, perverted crimes that he committed while celebrating his appointment to the Dagger Legion. Two of his foow victims died while another was left maimed and disfigured. As I had no desire to meet this monster, we camped outside of town in our wagons. In the morning, we loaded with iron and moved south to the capital of the nation, Donara. We arrived after five days on the road and. due to the late hour, found the gates barred against us. When we finally entered Donara the next morning I found it to he a large city, possibly larger than Bara ~ my home. It is built around one of the only high points in the area. As I discovered in the week that it took to conduct my business, it is segregated into two, totally different cities by the immense. double-walled fortress that surrounds it. The outer portion of Donara, containing over 60% of its population. is a dangerous and pestulant area where the poor eke out their existence, constantly under the thumb of the garrison and their masters on the hill. A goodly number of these people are Salaqi peasants, descendants of the former masters of the land who were brought here one hundred years ago as Donaran slaves. As a true Caldan, and loyal citizen of Bara, I was outraged at the condition of these people. They have no support from their betters. Most, if not all, exist day to day in a sickeningly harsh environment that is plagued with crime and disease. After seeing this abhorrent part of the city, I was astonished by the Inner City - where I went to trade my iron. This is the home of the nobility, the well-to-do and Donara’s tradesmen. It features wide, immaculate avenues and specious markets. In truth, the sight of it made me yearn for Bara, as it is nearly as beautiful as my home. Its citizens sustain themselves with the finest goods available in the world today. They have a grand and placid life, all within their wall. In comparison to the outer city, which is a festering boil, the inner part of Donara is paradise. Clearly. in Donara, the wealth and status of the individual is a great part of the difference between a generous, even luxurious, existence and a day-to-day fight for survival. When I sold my iron I had decided to extend my trading in this nation - for the profit of the venture. This decided, I acquired Donaran textiles and the local wines and left for Xian. a city in eastern Donara. On the morning after I acquired the final load (2/28/99} we set out. Some three days into this journey, my outriders came upon the bodies of three travellers - dead. They had been horribly mutilated by the talons of some terrible monster and left to die. Their mounts, if indeed they had any, were nowhere to he found and they had no property of any real value. After burying them, we moved on with great caution. The Principality of Xian differs from the Donara that we had seen thusfar. It is a far older culture, dating from before the Don host entered the land. To my eye, its people are a much more understandable and honorable lot than the Donarans. Though they are somewhat shy and reticent with strangers, they give due place to the family and take pride in the strength of those that lead them. While they lacked sophistication, their refreshing honesty and graciousness endeared them to me from the start. TRANSLATOR’S NOTE — While reading Redins' commentary about other lands, keep in mind again that he is a fierce patriot of Caldan, and that will tend to color his views a little. At this point, somewhat exhausted from my journey, I decided to rest in Xian. The next seven weeks were spent enjoying the hills of Xian, trading with passing caravans on the great road and regaining our strength. With the onset of spring (4/19/99) we joined a Marentia caravan that was travelling to Pelara, by way of Xadona. TRANSLATOR'S NOTE - Xian is essentially rural in character. The city is small, constructed out of wood and well-kept. Most of the citizens of the principality live in the hills, existing as miners, herders and hunters. Tav's friendship for them is most likely derived from a shared emphasis on the family and his atavistic fondness for the wild life of his barbarian forebears. Xadona is a strange city, especially when it is viewed with Donara in mind. It is the most well-organized city that I have ever seen. The streets are clean and the housing, even in the porest sections of the city, is solid and beautiful. Under the current Donan, ruler of the province and heir to the throne of Donara, the city has been rebuilt and greatly improved. The rights of the citizenry have been increased. Even the Salaqi, who make up a large share of the cities population, share in the benefits of full citizenship. Both Donan and his wife, the Donan Zephara, are loved by their subjects. TRANSLATOR'S NOTE - The Donan of this period instituted important social reforms while he ruled the province. The older, infested areas of the city were burnt to the ground and re-built at his expense. great public works projects made Xadona the showplace of the nation. When he assumed the throne in 1110 he was instrumental in re-uniting the people of Donara and,1123, became Donara's first Emperor. As we discovered in the four days thatw e remained in this city, Xadona is the most cultured city in Donara. It has a high level of intellectual achievement. Within its walls are immense structures that are devoted solely to te pursuit of knowlegde, which they call Gavilaria. Their justice system, administered by Donan's mentor and advisor, the wizard Morian, operates without the use of any kind of physical torture. Guilt is determined throught the use of magical herbs and spells. The verdicts are always quick, fair and honest in every way. I know this to be true for three of my Kazis were arrested and found innocent while my caravan was in the city. I am glad that it did not happen elsewhere in Donara. Elsewhere, if found innocent at all, my men would have been useless to me when te=e inquisitirs were brought with them. TRANSLATOR'S NOTE — Until the revision of the Donaran constitution in the year 1121, torture was an accepted means of getting felons to confess to their wrong doing. As a result, in most parts of Donara, the greta majority of persons that are arrested are convicted of the crime that they were arrested for. After a pleasurable sojourn in Xadona, we left for Pelara (4/25/99). Pelara is the largest and wealthiest city in Donara. It is a major sea port that handles over 75% of Donara's sea trade. On any day, hundreds of vessels can be found anchored in its spacious, heavily fortified harbor. When we entered the city, after passing the old border fortresses of the principality, mining towns and beautiful manors, we again found the normal Donaran mixture of opulence and squalor. Here it was even more pronounced than in the capital city. The hills of Pelura contain beautiful temples, fine manors and an immense old castle that is the home of its Prince. On the swampy, muddy flats, the common citizens live in a fetid area of twisting alleyways and squalid housing that is repugnant to my senses. In some parts of the poorest quarter, the dwellings that they call home are only partially roofed and hardly shelter at all. In Pelara, money is all important if one wishes to live in comfort. Without it, life can be a daily struggle against death. Another terrible feature of Pelara, which I experienced first hand, is the presence of a large, well-organized guild of criminals. This group, through terror and powerful connections in the city, literally rule the poor sections of Pelara at night. In the three days that i was forced to stay in this town, two of my Kazi were badly beaten and robbed and one of my wagons, loaded with copper from Xian, was stolen. My report of these atrocities to the local constabulary led to a "search" which resulted in nothing. Later, when an unsavory man with two armed companions demanded that I pay him tribute in order to retain my wealth, I decided that this city was not a fit place for man. After soundly thrashing them, with the aid of my drivers and the Kazi, I ventured to the wharf and contracted a vessel to carry us to Samana, Within three hours we were loaded and on our way west. TRANSLATOR'S NOTE -During this period of Donara's history, the Pelaran Thieves Guild contained over five hundred full time and associate members. Its influence extended up to two hundred miles from its base in Pelara. Without a doubt, it was the most powerful, criminal organization in the nation. Its master in the time of Tav's journey was named Shel, a brutal vicious and cunning killer with a great love for wealth and other pleasures. In Samana, the Sidh are considered to be devils. They are exterminated on sight, captured and executed or captured and used to train young elf-hounds. Our vessel landed in Samana after two days at sea (5/3/99). Samana is an exceptional strange city. Those of its citizens who can afford it live in manors outside of the city. Even its Prince refuses to reside within its walls. Only the poor reside within its walls. With this being the case, it is easy to understand why Samana was the poorest, dirtiest and most run-down city that l saw during my time in Donara. With a perverse wit, one might even imagine that the city walls were designed for keeping the poor in and not the enemy out. TRANSLATOR'S NOTE ~— With the primre cash crop of the principality being wine, the ownership of land is of immense importance in this principality. Thus, an iportant way to show one's status is to acquire, and live on, large tracts of land. This is also one of the underlying reasons for the extreme hatred that the people of Samana have for elves, i.e. the elves keep them from extensive lands that they feel should be theirs. As i discovered during my trading, fine dogs are highly prized in this principality, with large, fierce and fast hounds being especially preferred. Most families have at least one dog and a great number of the larger ones (25%) are trained to track and hunt Elves by scent. Every citizen of Samana that I met had a fierce hatred for the Sidh races, especially elves. I myself witnessed the death of two elves that were cornered by three hunters and their pack of twelve elfhounds. While I have no love for Elf-kind, as my rare associations with them have left me impressed with their arrogance, they should not be destroyed in this manner. After all, they are an intelligent and cultured people with an honorable determination to exterminate the true menace to the world, trolls. For their part in this great cause, surely man can tolerate their arrogance and condescending attitude. TRANSLATOR'5 NOTE - In Samana. the Sidh are considered to be devils. They are exterminated on sight, captured and executed or captured and used to train young elfhounds. Tav's attitude on the ill-treatment of elves is derived from the perennial conﬂict that his people fight against the troll hosts of the Elder Mountains. Since their arrival in Giant Pass more than six hundred years ago, they have been in an almost constant state of war against trolls, giants and other large creatures that were created by Kototh. The morning after the elf-murder, I loaded my remaining wagons with the fine wines and tapestries of Samana and headed east to Xalanara (5/10/99). On the way we had a strange encounter with a passing magician who, in exchange for a few bottles of wine, gave us a charm to ward off the monsters of the road ahead. It was truly an efficacious amulet for we encountered none on our journey. When we later tried to sell it in Xalanara, we discovered that the adepts of this rural backwater know little about such magics as all of them said that it was only a worthless pebble in a sack, it had no magical value. Pure nonsense of course. Later we found a passing barbarian who was more than happy to add its luck to his benefit in the travels to come. Xalanara is a rural city. It is surrounded by large ranches and pastures. The business of this principality is horses and cattle. Some of the finest livestock in the world is raised on these plains. The city itself is a dingy place with little to recommend it to the sophisticated traveller. The center of the town contains a large market square that primarily contains leather working shops, food stalls and corrals. The few taverns that are present are of two types, exceptional quality private clubs and public houses that are overly expensive. Finding the prices for horseflesh extremely low, and the quality high. I took the opportunity to trade for new draft horses and mounts, Two days were consumed in conducting this and other minor business. At the end of this time, we left the city heading east for Donara and home (5/16/99). When we reached Donara l chanced on Chai S'alav Caldo, a brother merchant. After much conversation, he informed me of immense profits that could me made in the Duchy of Salaqara, selling food and weapons to the Salaqi of that area. Though he stressed that such trade was a capital crime in Donara, the immorality of the restriction on the rights of this people and the profit to be had outweighed the potenttial danger of the situation. I determined to take the men of Salaqara all of the weapons that I could possibly lay my hands on. Through Chai l made contact with a 'tongueless' armorer and a guide that knew untravelled ways to reach Salaqara. After two weeks, i took delivery of the weapons, loaded my wagons and left the city. The journey to Salaqara took two weeks. We travelled the road for three days and, led by our guide, turned southeast and left the road. For the next seven days we travelled by night through the plains. On the night of our tenth day we reached the river and, to our dismay, found it to be unfordable. The next morning, while building rafts to float our wagons, we were attacked by a boatload of river pirates. Though we defeated them, our guide and one of my Kazi were killed. Others were severely wounded. After this encounter. i decided to forget the wagons and animals. We released the horses and burned the wagons. After loading our goods on three rafts, we began our journey down the river Salaq. (Which the Dona ran's prefer to call the River Don.) During our second night on this river, we had a terrible encounter with strange creatures from the water below. All of us were burned terribly by the acidic touch of the blue-skinned women that assailed us. One Kazi and three drivers were killed in the defense of my property. All of us were badly burned before we discovered their weakness and destroyed them. It was a horror. On the third night, hours before we landed east of Salaqara, a strange serpent attacked us firing Lightning from his eyes. Terrified. we ﬂed with due haste but could not avoid losing two more men and one of the rafts. Using the guides map, we moved into an old ruin on the outskirts of the city and set up our guard in a broken crypt beneath an ancient statue. There we awaited our buyers. Before our customers came to us, we spent a petrifying six hours. All of us imagined the dead in a nearby part of the cemetery rising from a mass grave and stalking the cemetery for prey. We froze and through some lucky twist of fate survived until the appointed hour. Our encounter with our buyers began when eight men came out of nowhere and, bows cocked and weapons drawn, surrounded us. After we dropped our weapons, much to the chagrin of the Kazi, a tall, thin figure dressed totally in black walked out of the shadows and demanded to know who we might be. When he was sure of us, he ordered his men to lower their bows and sheath their swords. After apologising for his "little surprise" he introduced himself as the Grand Master of the Sea Star Society and the True King of Salaq. Somewhat taken aback by his attitude, and the force of arms that surrounded us, I did not negotiate for the best possible price. In- stead, I took the fifty gold coins that they offered for my twenty swords and fifteen bows and made a rapid exit from this haunted trap. We spent that night in the city of Salaqara at a fine tavern called the Inn of the Golden Oro. While we endeavored to lose consciousness, we listened to the talk of those around us and were surprised at the vociferous hatred that all expressed for the Donarans. After this night, we left as soon as the sun was visible in the new morning. From what I saw, it is obvious that Donara's control over this ancient land is tenuous. It is maintained by immoral restrictions on the freedom of the people and a bloody reign of terror by their garrison and local nobles. Every citizen, however cowered and timid he appears in the presence of Donarans, is a defiant and merciless enemy of these conquerors who will take any opportunity to destroy them. Every citizen, however cowered and timid he appears in the presence of Donarans, is a defiant and merciless enemy of these conquerors who will take any opportunity to destroy them. It is a situation that overflows with violent emotions and terrible hatreds. I have no doubt, that in the very near future it will lead to a bloody civil war that will strike a serious blow against the Kingdom of Donarab stability. TRANSLATOR'S NOTE - In the year 1104 rebel forces, led by the Duke Vobai of Salaqara, led a coup that annihilated the Donarans in the city of Salaqara and the fortresses to the north, east of the River Salaq. tn the seven year civil war that followed, the area and the royal forces of Donara were nearly destroyed. Many nations, including Clima, Shiben and the Empire of the Ced sent forces to aid the newly emergent Kingdom of Salaq. Finally, in the year 1111, Salaq's independence was granted by a new ruler — on the condition that all foreign forces be removed. In the twelve years that followed, Salaq returned to the Donaran state as a locally independent Kingdom within the Donaran Empire. As part of this agreement, she was given suzerainty over Xadona, Ticasi. Shiben and Chiros. Within six months, in repayment for their treachery of 999, the city of Chiros was burned to the ground with the permission of the Emperor. At the time of Drachir Redins, the Dual Crown of the Donaran Empire rules a unified and happy people and is the dominant power in the west. Tav S‘bartav Bara never returned to Donara. In private letters that were found in the library of Drachir Redins, he stated his intention never to visit "the festering south" again. The remainder of his merchant career was spent training in the Kaz, with Djanesborg and on the western road through the Kaz to Dirllar. Many of his adventures in these days is worthy of comment and is men- tioned in the great work of Drachir Redins, "The Lives of the Caldan Merchants". Finally. some background in the general forms of Old Donaran may be of use in understanding some of the terms that are used in this folio. As a general rule, the word suffix "ara" means. literally. "house of". The suffix “an” means "son". Thus, the city of Pelara, literally, is the House of Pel. The noble Donan is, literally, the Don Son. As a tradition, all cities, villages, counties, etc. are named after the royal name of the house that rules that area. Thus the county that is ruled by the family Mord is Mordara. A final suffix that is found in city names, "ona", differs. Its literal meaning is "camp of", "people of" or "land of" depending on the historical associations of the root name that it is attached to. Thus, Samana (which is spelled Samana because the form M—vowel-N must use an A in Old Donaran) means "Camp of Sam" while Xadona, a province created arounda conquered Salaqi city, means "Land of Xad". (To further confuse, in the Salaq dialect the form "people of" is indicated by the sufﬁx "i" at the end of a noun. Thus, while the Donarans call the people of Pelara the Pelona, the Salaqi call them the Peli.